Region: Many species exist throughout North America. Life cycle: This Beetle produces only one generation each year. The adults will hibernate in the soil. 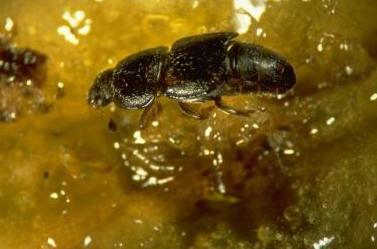 Physical Description: This 1/4 inch long beetle is black, shiny, and somewhat flattened with a large head and punctures in the wing covers. Feeding characteristics: Some species are predators of scale insects, but most adults and larvae feed on rotten fruits, garbage or tree sap. Controls: Controls are not usually necessary, but if damage is intolerable, use rotenone.